Never Summer have produced an agile, free feeling riding longboard named Motive. We thought from the shape of the top mounted deck it looked great for bombing down hills but didn't anticipate it to be much good for carving and quick turns. However, after riding the Motive Longboard down roads and on boardwalks, the fact is it spoils us with its brilliant turning and stability capabilities. We found the board to be extremely powerful and exceptionally rugged too. The Never Summer Motive measures 33.2 inches in length, 9.95 inches in width and has a wheel base of 25.2 inches which is adjustable to 26.5 inches. But the surprising thing about this board is its incredibly thin deck which enables a low weight for a board that measures 33.2 inches. It weighs 3.9kg which is the same as the Penny Nickel Skateboard that is 27 inches in length, making it remarkably light and an easy board to carry and commute with. Being so light in weight, skinny and flexible, allows riders of the board to pull off tricks, especially flips of all nature. 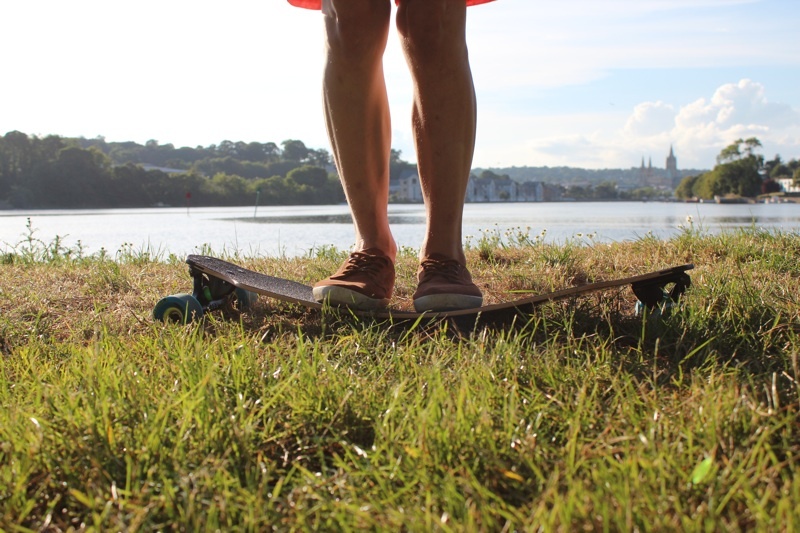 We've been enjoying the airy kick flips achieved from the Never Summer Motive Longboard, it's so easy to catch hold of due its thinness and doesn't strain the body due to its lightness. The deck is constructed with bi-directional fibreglass and a laminated wood core precision-milled to the thousandth of an inch for consistent flex patterns. In the deck are also elastomeric rubber foil laminates (RDS - Rubber Dampening System) which help lower the vibration levels from the trucks and reduce foot fatigue. All this deck innovation enables a liberal flexibility with a sharp snap back. You may be wondering whether this means the board sags because it's so light, but for people who weigh up to 14 stone the board sets itself unchanged. It's only when you apply force that the board flexes. 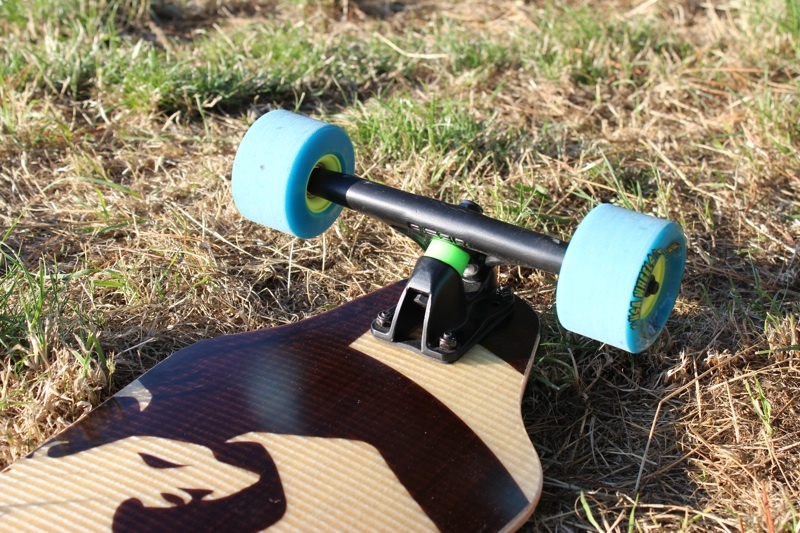 One thing we were impressed with when using the longboard was its P-Tech nose and tail protecters which are like little rubber bumpers for your longboard. We all know that when you fall off a longboard it sometimes slams into a wall or other dense object. We thought they enhanced the design and no doubt helped protect the longboard from any hard impacts the Motive has had. On the bottom of the deck sits a stylish graphic of an eagle which has been sublimated onto a co- extruded thermoplastic sheet that is scratch and chip resistant. We've heavily tested this sheeting and can vouch for its resistance; it's something we'd like implemented more on longboards and skateboards, there's nothing worse than getting a shiny new board and scratching the pristine artwork, so this is a great feature. 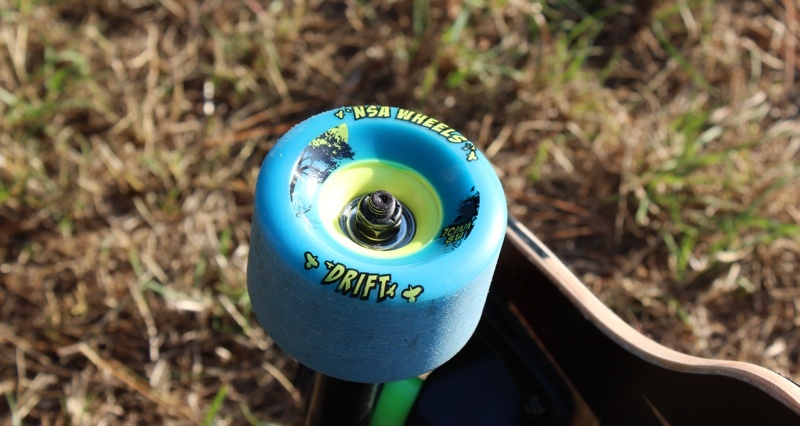 The wheels are NSA Hustle 75mm 80A Cyan which have a rough texture and provide a firm and comfortable ride with ample feedback but also provide powerful grip and help the board to be rock solid sturdy in most scenarios. We're unsure what the bearings ABEC measurement is but the roll goes on and on and high speeds don't lose momentum quickly. The cut out shape of the deck eliminates wheel bite and the RDS Rubber Dampening System secures a smooth ride, which is also helped by the wheels. On top of the deck is black very course grip tape with the initials NS cut out displaying the wood underneath. We found the grip tape leant a superb hand with our balance and improved our overall control when going very fast downhill. Motives setup includes 180 Bear Trucks - Matte Black, with 1/8" risers - which hold the board off the ground, and coupled with the soft bushings, give a floaty/wavy feel when turning. These trucks proved to deliver a thrilling downhill riding experience, high speeds of over 30 mph were stable and exhilarating. We were surprised with the top notch downhill riding style seen from the Motive, the deck is extremely thin but defiantly solid and steady when tearing downhill, and the course grip tape, concave camber and textured wheels only aided this experience. The trucks aren't directly fixed to the deck due to the 1/8" riders which defer cracking of the deck. Turning and carving is awesome with its powerful concave camber that allows you to do quick turns and silky slides in conjunction with the NSA Hustle wheels whilst feeling confidently locked onto the board. The wheels, airy trucks and wheel base translate to some thrilling and energising carving fun! We use the Motive for general commuting, because it's not overly long, it's very light and has a nimble turning capability, make sure our ride is unchallenged and that we can wiggle in and out of obstacles and pump a little too. Never Summer have clearly put an outstanding amount of thought into the design characteristics of this longboard. It's a very rugged and durably built board, producing competant downhill rushes and floaty quick response carving and turns. It has the ability to pull off a plethora of tricks because of its light and thin design. This is a longboard that is going to suit a wide audience; we have nothing but praise for this board.